At NUTS 1 level (Wales, Scotland, NI and the nine regions of England) Wales is at the bottom of the GVA per head table, at 75% of the UK Average. Next is NE England at 79%. London is way ahead at 152% with SE England at 113%. At NUTS 2 level, West Wales and the Valleys are second bottom at 64% (Cornwall is just below us at 63%). Inner London is at 279%. The difference between top and bottom is over 4 times. At NUTS 3 Level, Wales has three areas in the bottom five: Ynys Mon bottom at 56%, the Gwent Valleys at 58% and the Central Valleys at 60%. Inner London West is at a staggering 492% ... nearly nine times greater than Ynys Mon. 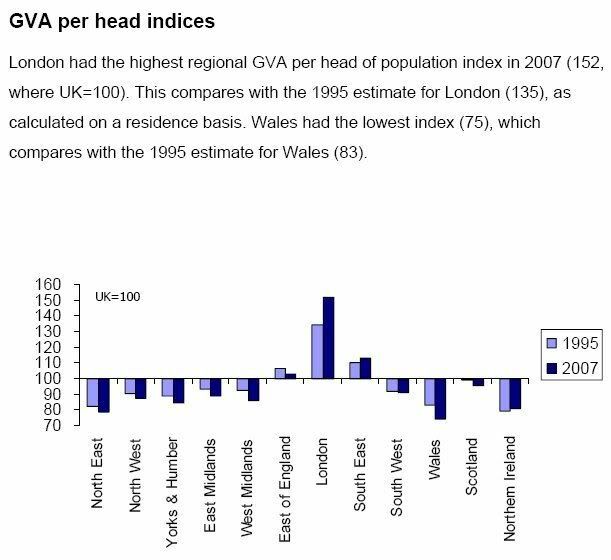 There are a few points to note, the first is that GVA per head in Wales is going up. It has risen from £10,290 in 1998 to £14,887 in 2007. But it has not risen as quickly as elsewhere in the UK. The second is that GVA is not a measure of standard of living, because certain things (notably housing) cost much more in places like London than in Wales. Bear in mind that these are 2007 figures, before the credit crunch. It shows that the GVA of London has grown at the expense of nearly everywhere else in the UK. In other words, that the UK government is still pursuing policies that encourage rather than alleviate over-centralization. There'll be plenty of people who say this proves that Wales can't afford to be independent. I think it shows that we can't afford to go on like this. Labour told us that the aim of their policies was to get our GDP up to 90% of the UK average, but it's gone in the opposite direction.